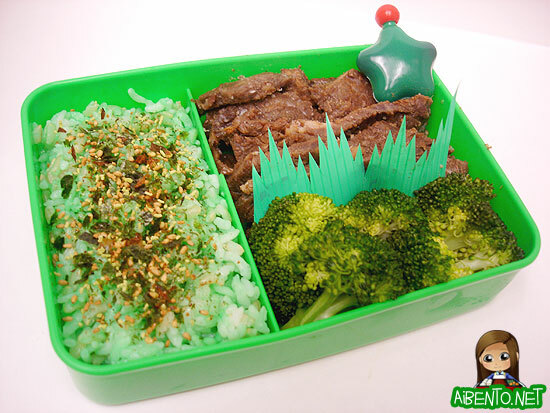 I had put this bento into the same Bonnie Bear box from yesterday but then decided that with the broccoli, I’d do one more green entry for bentochallenge and so moved it into the same kind of box, only green. The box is rather amusing, the saying on the front is, “Classy Croaky… is funniest and dedicated, his the best player on the team.” lol! I added a drop of green food coloring to a bit of water and then mixed the rice in. Doesn’t it look so freaky?!? 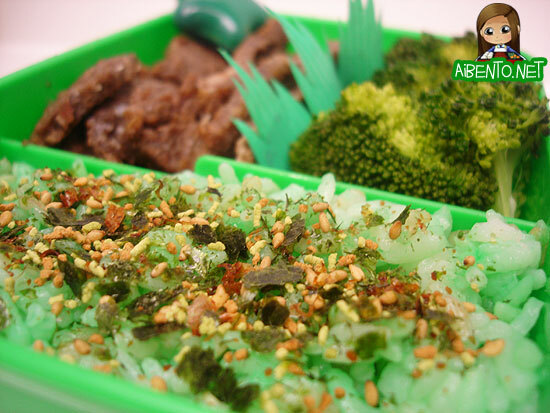 I added a packet of green furikake but it turns out it’s not that green. Not a very exciting bento, but you can’t deny it’s very green!! I put soy sauce in the little bottle but I’m unsure whether I’ll use it. If anything I’ll add it to the broccoli for a bit of taste. I’m so bad about shoyu like that. And here my cousin was just telling me how it’s so great that I eat healthy, then I add shoyu to a bento just for the container. D: I may end up going to Marukai tonight as I have to leave early to go get screwed over by my car registration fees at Satellite City Hall today. Hopefully they’re not so bare anymore! !